Professional Stamps USA Custom - Stamps Signs Badges. Customized, laser engraved or full color. Design online! 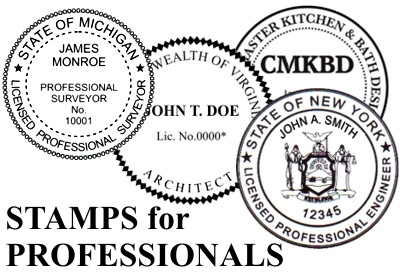 Stamps for professionals: Engineers, Architects, Landscape / Interior Designers, Bath & Kitchen Designers, etc. We will set the provided information to State regulations based on our templates and the latest state board requirements. *State Professional Stamps are offered in sizes of 1-5/8" or 2". When selecting your stamp, please refer to your State Board guidelines for any requirements on stamp size. Stamp options are self-inking, pre-inked or standard hand stamp. See below for notes on the differences. Brand differences vary but are all similar in function. Choice may be determined by price or preference to any brand or the other. Self-Inking: These stamps hold an ink pad within the stamp mechanism. The stamp surface is held on the pad and when pressed, the stamp is flipped on an internal track to push the inked surface into the impression area. These are reliable with easily replaceable ink pads. Standard Hand Stamp: The hand stamp is the oldest and very basic design. These have the stamp die mounted with a handle and use an external ink pad. Tap the ink pad then the surface to printed. The ink pads can be easily replaced or re-filled.